"Camps ... engender near-complete dependency and can create tensions between host-country nationals and refugees that jeopardize the well-being of both." Refugees International (RI) advocates for protection for displaced peoples. In the following viewpoint, the organization reports on the Syrian refugee situation in Turkey and Jordan. It asserts that the situation is increasingly difficult and argues that refugees need to be allowed to leave camps and seek out jobs and other opportunities. It contends that restricting refugees to camps limits their independence and freedom and concludes that more aid and support is needed for refugees who are not in camps. This viewpoint is excerpted and adapted from the organization's full report. In what ways does RI say that the situation facing Syrians varies from country to country? What document pertaining to refugees has the Turkish government not made public, according to the author? What problems does RI identify with the Zaatari camp in Jordan? The civil war in Syria has forced large numbers of Syrians from their homes, and in many cases from the country entirely. Refugees continue to flee in record numbers, and there are currently almost 400,000 registered or waiting for registration in Iraq, Jordan, Lebanon, and Turkey combined. The United Nations has said it expects this number could reach 700,000 by December 31, 2012. About half of all the registered Syrians are living in camps, but the other half remain in local host communities trying to get by on their own. In October 2012, Refugees International [RI] spent several weeks visiting Syrian refugee camps and urban Syrian refugee populations in Turkey, Jordan, and Iraq. The situation facing Syrians varies from country to country. For example, in Turkey, many of the refugees, aid workers, and activists RI interviewed said that the Turkish government's camps are acceptable, even if not ideal. In Jordan and Iraq, the camps need improvement, but people living in them can obtain minimal services. A major challenge that exists in all three countries, however, is the specific vulnerability of urban Syrian refugee populations. Many of the Syrians who now live in neighboring countries brought some financial resources with them, but these will not last long—and for many families, they have already run out. Once they are unable to obtain shelter on their own, they face a stark choice: either move to a camp for assistance, or struggle through the winter in urban areas where there is very little support and where the numbers of Syrian refugees needing help get larger and larger. Though urban refugees generally also need assistance with the costs of food, medical care, and transportation, their most pressing need is often maintaining their residence so that the alternative (relocating to a camp) does not become necessary. The camps in all three countries RI visited are already at capacity or overcrowded, with more Syrians crossing the border every day or moving in from urban areas. These camp residents are not always free to come and go as they see fit—whether for work, specialized medical care, or to visit family. But as the attached reports make clear, each country also faces its own unique problems in dealing with fleeing Syrians. Thousands are stuck inside Syria, just beyond the Turkish border, where they are waiting for the Turkish government to build more accommodations and let them in. Service providers in the Jordanian and Iraqi camps are struggling to meet even the most basic protection needs, such as registration and emergency medical care. In all three countries, circumstances are already extremely difficult for both refugees and service providers, but the lack of progress toward a political settlement in Syria points toward even further deterioration. While camps may make it easier for governments and aid agencies to locate, register, and protect people by keeping them in a defined location, they also prevent people from being as self-sufficient as possible. Living outside of camps in host communities can afford refugees opportunities to work and provide for themselves, to learn new skills, and to develop support networks in a community. All of these facilitate reintegration—in this case, return to Syria—when the time comes, as people will have resources to take back with them. Life outside a camp also helps maintain dignity by offering people a more independent life. The Syrian refugee camps in all three countries RI visited are either at or over capacity and cannot keep up with the pace of arrivals. For all of these reasons, it is essential that assistance programs support the integration of refugees into non-camp situations whenever possible. Since the beginning of the conflict in Syria in early 2011, Turkey has done an admirable job of receiving and hosting Syrian refugees using its own financial and human resources. There are now over 120,000 Syrian refugees registered in the country, most of whom live in one of 14 camps spread out across the southeast. The Turkish government did not allow RI access to any of these refugee camps, but they are generally acknowledged to provide adequate services and acceptable living conditions. However, the situation for Syrian refugees living outside the camps in Turkey is quite different. Support for this population is practically non-existent, and the government of Turkey should offer assistance in order to prevent people from having to relocate to a camp—where they would prefer not to live—in order to seek help. For almost two years, Turkey has kept its border open to Syrians fleeing the conflict in their country. Turkish law provides temporary asylum on an individual basis to non-European refugees entering its territory. Faced with the mass influx of Syrians fleeing conflict, Turkey established a group designation called temporary protection. Reportedly, under an April 2012 government directive, this designation allows Syrian refugees to enter Turkey and prohibits their forced return to Syria. However, it remains unclear how temporary protection applies to Syrians living outside the camps. The principle of temporary protection for Syrians who enter camps after crossing the border allows them to register with the Turkish government and receive support within the confines of the camp. There are no questions about their status or whether or not they are eligible for help, and it is clear that they cannot be returned to Syria against their will. The camps themselves are at capacity, and there are thousands of people being held up on the Syrian side of the border until more accommodation can be built. Turkey appears willing to accept them as space becomes available and to address their humanitarian needs—like shelter, food, and medical attention—all under the auspices of providing temporary protection. However, there are now also tens of thousands of Syrians living in cities and towns with few options for support, since there is no social services network available to them. They are not able to register with the Turkish government or the UN Refugee Agency (UNHCR) because such a process does not exist outside the camps. They must pay independently for rent, food, and health care. And as their savings dwindle, their main option for obtaining help is to move into one of the camps. The Turkish government has offered no official guidance as to how the temporary protection policy applies to Syrian refugees outside the camps, and the rights and responsibilities of these non-camp Syrians remain unclear. It is generally understood that they cannot be returned to Syria, but their humanitarian needs like shelter and food are not being addressed by any agency. Furthermore, there is no consistent guidance on whether or not they can officially maintain legal residence in Turkey outside the camps. As a result, they live in constant fear of having to move to a camp, where they would be separated from whatever family, friends, and support they may have in the cities. The Turkish government issued a directive in April 2012 on how the temporary protection policy applies to different categories of Syrian refugees, but it has not been made public and therefore offers no practical guidance for government officials, service providers, and refugees themselves. The Turkish government should immediately make public the April 2012 directive and should provide official guidance as to how the policy applies to Syrians outside of the camps. There is no officially-accepted data on how many Syrians are living outside the camps in Turkey. This is partly because refugees in a community setting cannot register for assistance, and partly because some do not want to come forward and reveal their identity or location. Best guesses, however, put the number at about 70,000. These are people who rent residences and meet all their daily needs independently. If they need medical help then they must pay for it at the rates for private care; if they need trauma counseling for the children then they must find and pay for it on their own; and when the prices of rent and food rise they must somehow find a way to adjust. The ability to register with an organization that can identify a refugee's particular needs and help them find assistance is one of the most basic protection measures in any setting. By creating a record of who is present and what makes them vulnerable, humanitarian aid agencies can understand how many people are in need, where they are located, and what specific services are most essential. While the absence of support services for the urban Syrian refugee population is alarming, those services cannot be developed without first having a clear understanding of who is present and what their needs are. Registration—either in a camp, or in an urban setting—is one of the simplest ways to begin assessing the condition of a population and developing lifesaving responses. This is particularly important with a refugee flow as large and constantly-fluctuating as the Syrian one. The Turkish government, in coordination with the UNHCR, must establish a registration process for refugees living outside of the camps. The refugee camps run by the Turkish government allow Syrians access to services that address their basic protection and survival needs. More than that, they offer routine medical care, education, ways to reunite families who have been separated, and opportunities for social interactions that help refugees maintain their mental well-being. In many settings, such assistance also exists through networks of service organizations in urban areas; in Turkey, however, there are none. Some enterprising Syrian refugees in Turkish cities and towns have created their own aid networks. They do their best to help meet the financial and material needs of their population, to establish educational programs for both children and adults, and to provide a community atmosphere in which people can find emotional support and feel safe in a new and unfamiliar place. But the size of these groups is limited by the financial resources of the people who create them. Once the money runs out, these Syrian refugees lose their support system, and it is at this point that many have to make the difficult decision to move into a camp to survive. Refugees who do not live in camps generally have some advantages over those who do. Besides maintaining a higher degree of independence, they may be able to earn money, learn skills, remain with a supportive community, and be able to contribute to the host community as well. These individuals then have an easier transition when they are able to return to their own country, as they have been active in sustaining themselves on a daily basis and have maintained those abilities. This is important both for refugee return, and for the rebuilding of a country when it is able to receive its population safely. While in Turkey, the RI team met Syrian refugees who were suffering for a variety of reasons. Some had tourist visas that were about to expire but were afraid to ask the police for advice because of their uncertain status under temporary protection. Some had serious medical problems but could not go to the hospital because of the expense. Some lacked things as basic as food and clothing and had to rely on the goodwill of neighbors. All were understandably anxious at the prospect of moving to a crowded camp and losing their autonomy, but none could see any other option short of going back to Syria. The Turkish government should establish services for these urban refugees, or else allow other groups to establish them. Close to 130,000 Syrian refugees are already living in government-run camps in Turkey, and yet Syrians continue to approach the Turkish border in record numbers. Approximately 10,000 are held upon the Syrian side of the Turkey-Syria border, and they will be allowed to cross only after the Turkish government has constructed a physical space where they can live—in essence, a space in a camp. In addition to this large vulnerable group waiting at the border, urban refugees in Turkey suffer from a complete lack of services and assistance that in many cases will eventually drive them into the camps as well. In order to ensure the protection of Syrian refugees, and to provide support in more than just words, the Turkish government must define its temporary protection policy—particularly as it applies to Syrians outside the camps. This policy must then be further bolstered by allowing urban Syrian refugees to register and receive humanitarian assistance through either the Turkish government or the UNHCR. The number of Syrian refugees living in Jordan has swelled to over 100,000 and continues to increase. As they cross the border, many Syrians are being directed into the Zaatari camp, where conditions and services fail to meet international standards. Simultaneously, host communities who have welcomed refugees are under increasing pressure because of the need to share limited resources with their guests. Jordan's border remains open in a clear demonstration of the government's humanitarian commitment towards Syrian refugees. But without greater technical and financial assistance from the international community, these Syrians will be less welcome by host communities and will face more insecurity. An RI team visited Jordan in June 2012 and observed many Syrian refugees going into Jordanian host communities, while a smaller number remained in the transit centers for long periods. At that time, there were three transit centers at the northern border where arriving Syrians could receive shelter, food, and medical care. After being screened, these individuals were released through a sponsor living in Jordan. The transit centers have since been closed and a camp (Zaatari) has opened instead. When RI returned to Jordan in October, most Syrians arriving at the border were being directed to the camp, where they could receive some assistance but usually not leave. This policy of funneling new arrivals to the camp limits their mobility and self-sufficiency, and large numbers of refugees have left the camp without permission—sometimes even to return to Syria. While camps can help governments and agencies keep track of who is in the country and what their needs are, they engender near-complete dependency and can create tensions between host-country nationals and refugees that jeopardize the well-being of both. Once a Syrian refugee has crossed the border into Jordan, the Jordanian police take their identity documents and the refugee receives only a receipt for having turned them over. It is not clear that refugees are able to retrieve their documents upon request. Thus, Syrians who decide to leave the Zaatari camp sometimes do so without any form of documentation. Those who are desperate enough to return to Syria without identification will be even more vulnerable to abuse. This problem is compounded by the fact that more and more refugees are attempting to leave the camp due to poor conditions. Zaatari is hot and dusty during the day, overcrowded, and has inadequate shelter for the approaching winter. Moreover, camp rules prevent residents from leaving the camp to find work. The process that used to allow Syrians to leave the transit centers is used much more selectively in the camp, and now a person can only leave for urgent humanitarian reasons, such as a medical emergency. In one Jordanian hospital, RI met a group of family members who had been transferred out of the camp for specialized health care, but had to leave their 13- and 11-year-old daughters behind without a guardian. Repeated requests to reunite the minors with their family were refused because this did not qualify as an urgent humanitarian situation. The Jordanian government should allow Syrians entering the country with documents to retain them in order to minimize cases like these, and to reduce the risk of Syrians being undocumented when leaving the camp. Zaatari camp is located not far from a small Jordanian town, yet its tens of thousands of residents are stuck living in tents in a restricted area of the desert. The majority use communal latrines, showers, and kitchens. In addition to the tensions that often arise when people are in such cramped quarters, conditions in the camp are clearly unacceptable in many ways. Camp medical services are quite developed and residents can be referred out for specialized care. However, the elementary school is significantly overcrowded, the child-friendly spaces are desolate, the women's center is located on the periphery of the camp and is difficult to find, and the refugees are not free to seek work or other accommodations outside the camp. Many Syrians departed "unofficially" after the situation became too difficult to endure. During RI's visit, a group of about 15 family members was preparing to leave Zaatari and return to Syria. When asked about this decision, they acknowledged that they did not feel safe returning. They maintained, however, that they could no longer handle daily life in the camp and would rather face the hardships at home. Aid organizations are working hard in the camp to identify needs and provide support, but the constant new arrivals and lack of capacity make it difficult for them to keep up with the work. For those Syrians who have been living in urban settings in Jordan for some time (and for the few recent arrivals who have been able to avoid going to Zaatari), the host community is becoming increasingly unwelcoming. Refugees are eligible for services at a number of medical clinics and children have been allowed to enroll in the public school system where there is space. However, the price of rent and food is high, and more than anything people need rental assistance to retain their living quarters. A handful of international organizations provide some financial support for rent and living expenses, but only a small fraction of the urban population receives this help; the rest are on their own. As Syrians run out of savings to sustain them in Jordan, more and more of them are moving to Zaatari to seek out the services they need. To avoid further swelling the camp population, aid agencies should start by distributing rental assistance to the wider urban population. Food and household items must also be offered to larger numbers of people, along with winterization materials like heaters and fuel. The Jordan Hashemite Charity Organization, which coordinates the government's response to Syrian refugees, should prioritize this type of assistance for larger numbers of urban refugees. 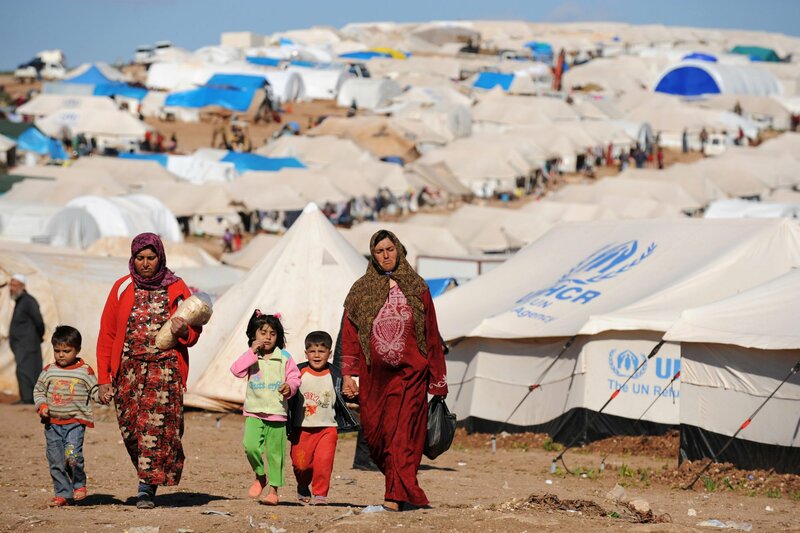 Jordan has any number of humanitarian organizations that are equipped and eager to assist Syrian refugees. Unfortunately, the U.S. Department of State, the core donor to these local aid groups, has provided little in the way of new funding to these service providers. Funding for local NGOs [nongovernmental organizations] serving Syrian refugees was limited to $3 million and four organizations across the region in 2012. As a result, Syrians seeking to remain in urban settings can access few services. As greater numbers of Syrian refugees flee the conflict, services that allow individuals to live with minimal assistance outside of camps have become increasingly scarce. In interviews, RI learned that several organizations have been forced to make a hard choice about whom to assist, as they cannot afford to support both camp and urban populations. The U.S. Bureau of Population, Refugees, and Migration (PRM) and European donors should increase funding to inter-governmental and non-governmental organization partners operating in Jordan, both in the Zaatari camp and urban settings. Since RI's previous visit in June 2012, little has improved for Syrian refugees in Jordan. In fact, some aspects of the situation are worse. There is now a camp housing tens of thousands, services in that camp are inadequate, fewer people are allowed out into the host community, and services for urban refugees are still lacking. Even those who do live in host communities are finding that tensions with Jordanians have increased. The Jordanian government is to be commended for keeping its border open. However, in order to maintain this policy and minimize the strain on the host community, Jordan must receive better support in providing adequate services for both urban Syrian refugees and their Jordanian neighbors. "Camps Are a Poor Way to House Syrian Refugees." Syria. Ed. Noah Berlatsky. Farmington Hills, MI: Greenhaven Press, 2015. Opposing Viewpoints. Rpt. from "Syrian Refugees: Reliance on Camps Creates Few Good Options." 2012. Opposing Viewpoints in Context. Web. 17 Mar. 2016.